5 Tips to to Fix "iTunes Purchases Not Showing Up On iPhone"
Try restarting the specific app that is playing your purchased media. For example, if it’s music, try restarting the Music app and see if the song shows up. Do a hard restart so that all of your apps and processes have to start all over again. Many times this fixes the issue. Just like restarting your iPhone, signing in and out Apple ID can sometimes fix annoying software issues. This might also cause your iPhone to check to see if you have any new purchases when you sign back in. Step 1: Launch iTunes on computer and wait for everything to load. Step 2: Plug your iPhone into your computer and wait for it to show up as a device in iTunes. Step 3: Click on your device in iTunes so that you can see the Summary section. Step 4: On the left sidebar, tap the media type that you want to transfer, like Music. Step 6: Tap Apple to sync the iTunes music to iPhone. 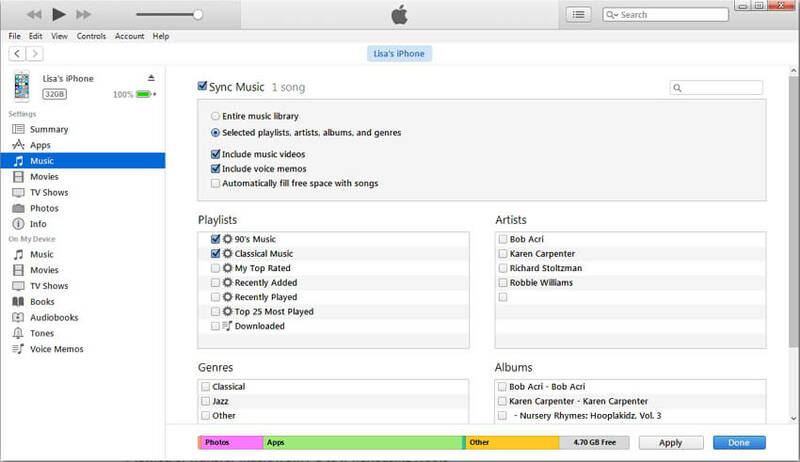 The existing music library will be overwritten when you sync music. That means you will lose all your iPhone music. 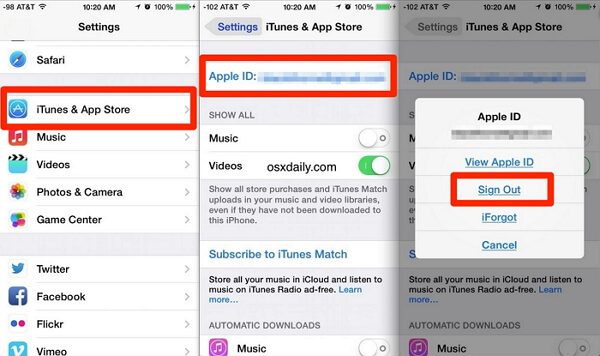 You can sync your iPhone to one iTunes library meanwhile, or your iPhone will be erased. If you fear that your iPhone media will be lost when syncing, then you can use a simple iTunes alternative tool like iMyFone TunesMate iPhone Transfer. This is an application that lets you bypass all of iTunes’ restrictions and greatly simplifies the process of transferring your files. Lots of media give high evaluation for TunesMate, like Geekreply, tricksworldzz.com, etc. Syncing iTunes library to iPhone won’t cover the existing media library on iPhone. Transfer both music that was purchased on iTunes and music that you downloaded from somewhere else. Directly add files to iPhone from computer instead of going through iTunes library. You can add files to and extract files from iTunes library without even having to open iTunes. Extract all kinds of media files from iPhone to computer/iTunes library, both purchases and non-purchases. Step 1: Download TunesMate and install it on your computer. After that is done, plug your iPhone into your computer’s USB port. Step 2: Open up TunesMate and click where it says “Transfer iTunes Media to iDevice” on the main screen. 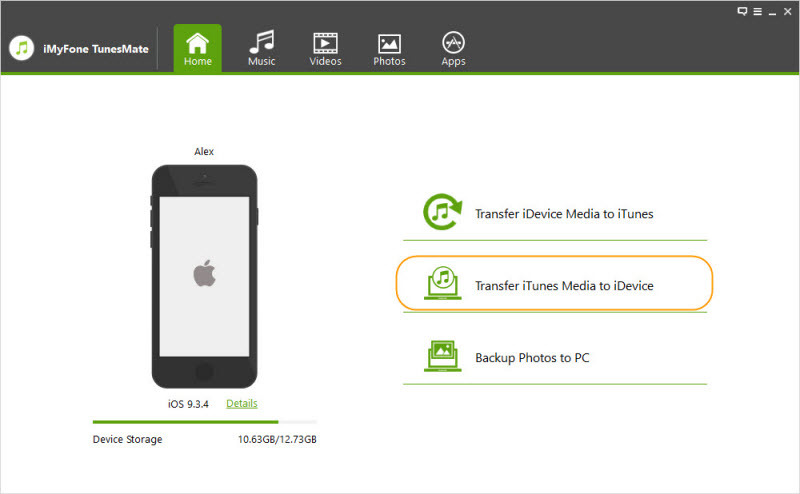 Step 3: Select what kind of media you want to transfer. In this case, it would be music, so make sure the box next to “Music” is selected. (It usually already is by default, along with others.) Click Transfer to begin. Or if you don’t want to transfer purchases from iTunes to iPhone, you could do a factory reset of your iPhone to fix “iTunes purchases not showing up”.. There are a few ways that you could do this. You could try using iTunes—all you have to do is go to your the Summary tab for your device and click to restore it to factory settings. This will delete all of the data on your phone, though. Of course, it’s suggested to backup your iPhone first, or you will lose everything.